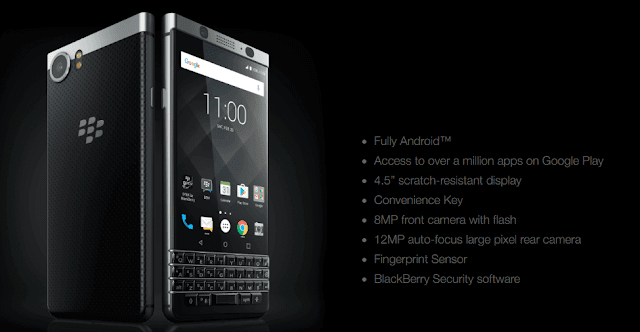 Blackberry launched its new limited edition smartphone 'KEYone' in India. This smartphone is not like another typical smartphones, it comes with both touchscreen and physical qwerty keyboard. The keyboard is capable for using as shortcuts to launch apps directly. Blackberry normally comes with single SIM slot but KEYone has dual SIM slots. The another main feature is it's biggest 3505 mAh battery for long usage and with fast Charge capability. 12 MP rear camera capable for 4K smooth video recording and 8 MP 84˚ wide angle selfie camera. Both cameras produce good quality photos and videos. Biggest 3505 mAh non-removable Lithium Ion battery, 50% charge in 36 minutes. Blackberry KEYone priced at about 39,990 RS in India and it available exclusively at Amazon India from 8th August 2017. With Blackberry KEYone Vodafone gives 75 GB free 4G Data with 3 Month validity for postpaid and prepaid customers.